My Dad & I decided to head back to Colorado again for the second year in a row for our Winter photography adventure. After arriving in Denver we first headed 8 miles away to Rocky Mountain Arsenal National Wildlife Refuge, a 16,000 acre area that used to be home to a chemical weapons manufacturing center. 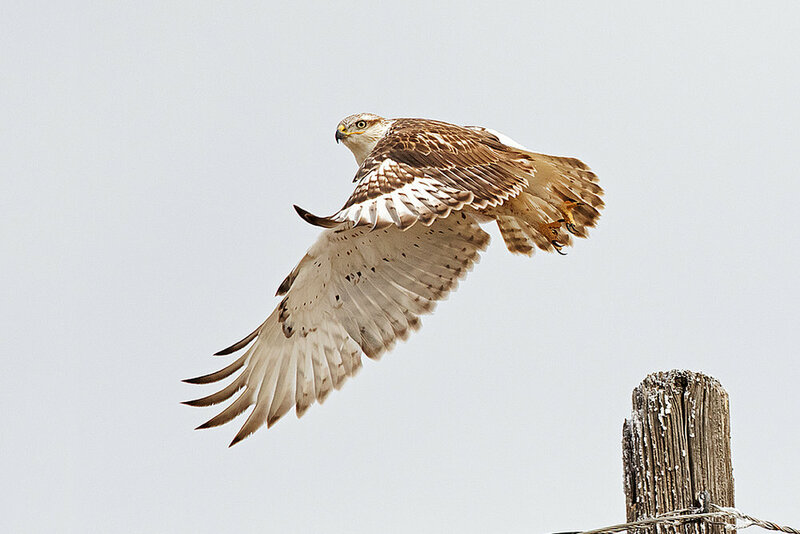 Drove around the loop there and saw a number of different raptors, getting good images of an American Kestrel & a uniquely marked Red-tailed Hawk. There were a ton of big prairie dogs there too poking out of their holes in the ground. Then we headed back to the Lamar area that we had spent time in last year for a similar stretch of time. We woke up the next morning in Lamar to this super thick frost on everything in sight including power line, tree, and blade of grass. 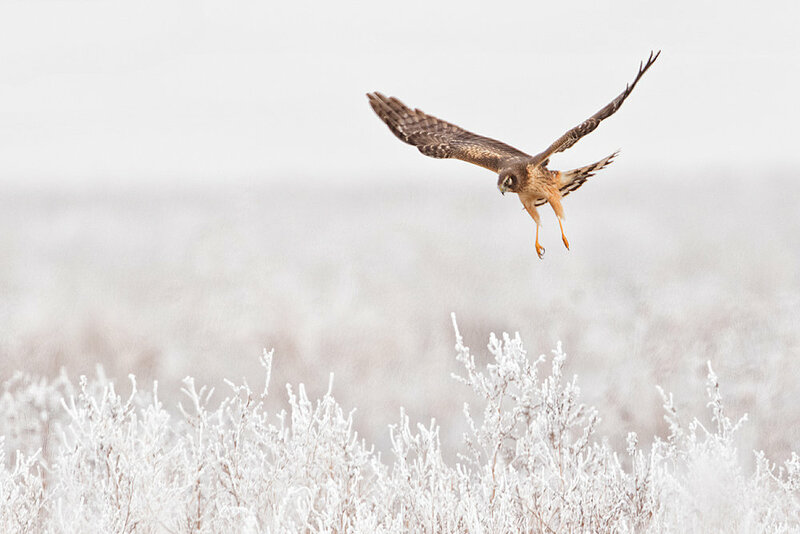 I got a great shot of a Northern Harrier flying low over a completely frozen field with it’s legs fully extended. This solitary cotton tree had caught my eye last year and we passed it again this year covered in this frost so I had to grab a shot of it before moving on. We came across a Merlin sitting on a fence post that ended up looking like a detailed watercolor painting in my images of it that I took. As the afternoon approached we decided to head over to the same area that we had captured the Great Horned Owl pair from last year. Sure enough they were in the same spot hanging out once again! We were able to get some amazing images of these incredible birds until there was no more light left to shoot. The next day we drove around numerous back roads searching for any raptors that we could photograph and had some good luck with a variety of hawks. We came across a huge flock of Snow Geese in a farm field that went up in the air as a truck drove down towards them. I grabbed for my camera quick to fire off some shots without checking any of the settings and then realized I had overexposed the shots. The look ended up being something I loved proving that sometimes mistakes turn into happy endings. 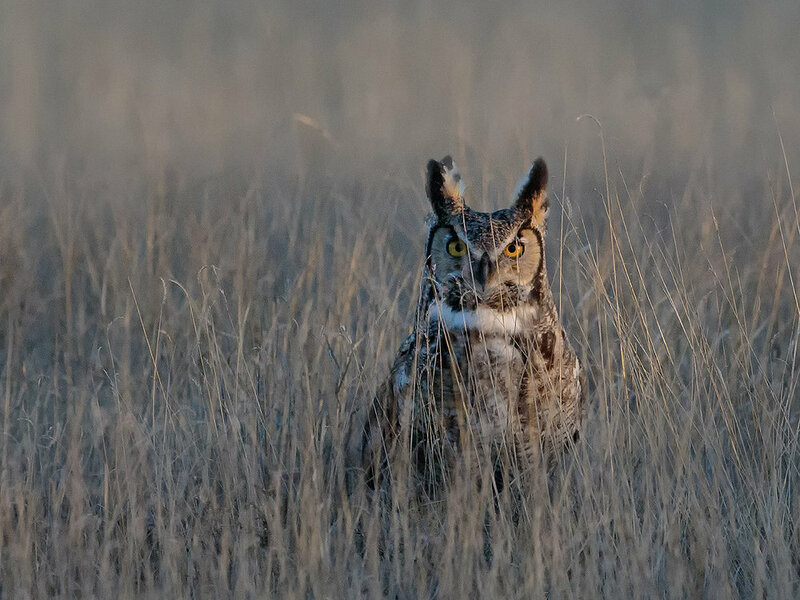 We swung back to our owl hotspot to end the day again and got some more awesome images, including one of the Great Horned Owl ejecting a pellet. The following day was a travel day heading back to Rocky Mountain National Park and stopping along the way in a few different spots, including a American Dipper swimming in a roadside stream. We were met with our familiar friendly Magpies inside the park as soon as we got there. The next few days would be spent cruising around the park enjoying the surreal views and resident creatures. 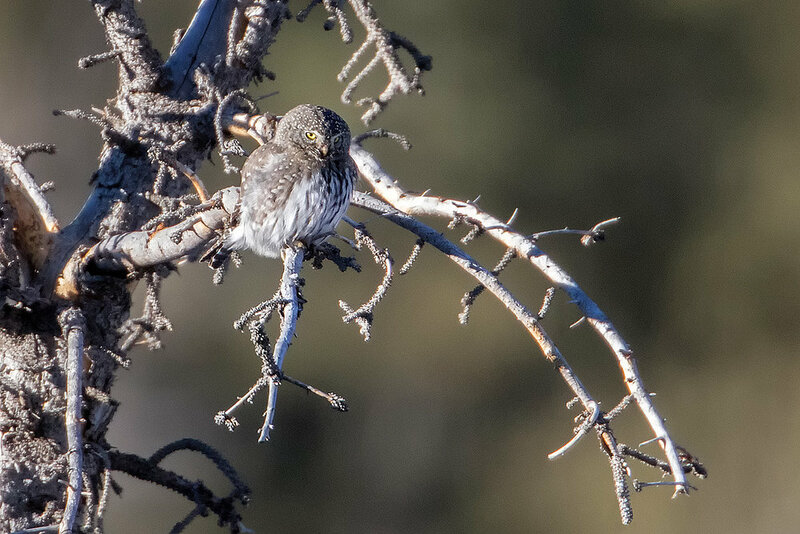 We somehow were able to find a tiny Pygmy Owl inside a different section of the park than we had last year. It was middle of the day lighting but we got some pretty great images despite. The odds of finding these mini owls two years in a row in a National Park of this size have to be incredibly low. The last morning of our trip was spent taking one last loop through the park and then making out way back to the Rocky Mountain Arsenal National Wildlife Refuge. Got a little bit more shutter therapy in before dropping off the rental car and heading to the airport. Feel like I’m really starting to get used to adventuring in these areas!